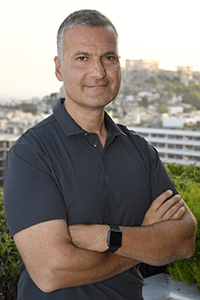 Zafiris J. Daskalakis is a Professor of Psychiatry, Temerty Chair in Therapeutic Brain Intervention and Chief of the Mood and Anxiety Division at CAMH. The Temerty Centre uses magnetic brain stimulation to study the role of cortical inhibition, plasticity and connectivity as potential pathophysiological mechanisms in schizophrenia, depression and obsessive compulsive disorder. Dr. Daskalakis also conducts treatment studies using repetitive transcranial magnetic brain stimulation (rTMS), magnetic seizure therapy (MST) and electroconvulsive therapy (ECT) for resistant symptoms in these disorders. He has received several national and international awards and distinctions including the Samarthji Lal Award in Mental Health Research from the Graham Boeckh Foundation for the top mid-career neuropsychopharmacology researcher in Canada in 2013. He also holds or has held NIMH and CIHR peer-reviewed funding and has also mentored numerous NARSAD Young Investigator awardees. Finally, he has over 290 peer-reviewed publications, books and book chapters and is an editorial board member for Biological Psychiatry and an Associate Editor for Clinical Neurophysiology.